4.30.2013. I carried two protective amulets -- charms -- on my keychain. I'm not superstitious but sometimes I like acting as if I were. I like the trappings of superstition. They're cool. They connect me to cultures broader and deeper than my tiny self-satisfied Planet Susan. My mother gave me the St. Christopher's medal. St. Christopher carried a child across the treacherous waters and the child turned out to be the boy Jesus. "Christopher" means "Christ-bearer." The large amber bead assembly is from Tibet. I don't know the specific symbolism -- we bought it along with 3 or 4 others at a bead shop in St. Louis. If pressed, I'd say it was an amulet for warding off the evil eye because the circular motif conjures up an eye. But who knows. I just like it. 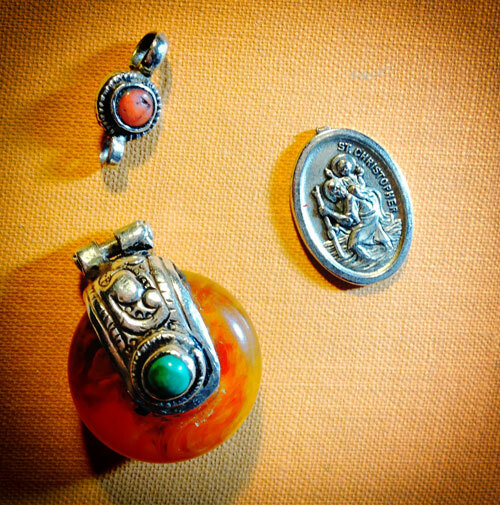 I'm impressed at the energy Tibetans -- isolated on their high Himalayan plateau -- put into their jewelry: amber from the Baltic, coral from the Mediterranean Sea, turquoise from China or Burma. That makes me think of ancient trade routes and how the longing for lovely rarities opened up the world and introduced cultures to one another in a peaceful way. Well, sadly, first the St. Christopher's medal snapped off its ring. That was a couple months ago. Then Saturday, suddenly the amber bead was gone. Only the tiny coral cabochon dangled from the keychain. I retraced my steps, cursing myself for carelessness in attaching such a precious object to such an active-duty key. Haven't I learned anything about taking care of my things??? Luckily, I found it in the bottom of my purse. Whew. It can be repaired. Now what? Last year in Florida I bought a glass and chrome pendant -- a tiny wearable display case for beach findings. Maybe I'll fill it with broken things and stray buttons. 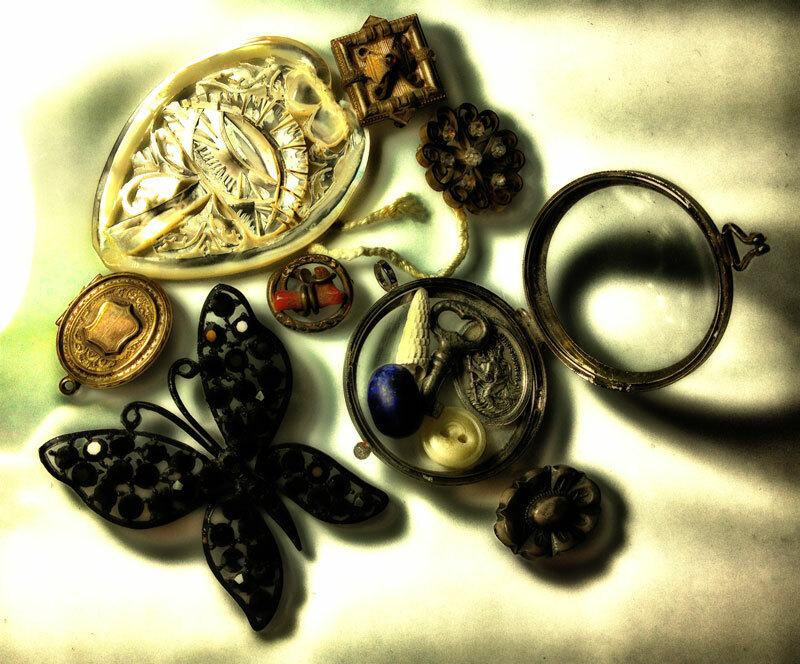 Come to think of it, I have a junk box full of broken things, too intiguing to toss into the trash. (See photo.) Maybe something there can be upcycled to a keychain dangle. Maybe I can find a little magic among the can't-throwaways.